Originally published under the title, "What Starts with the Jews: In Support of Netanyahu's Speech to the US Congress." 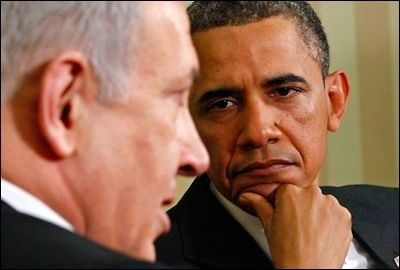 U.S. President Barack Obama and Israeli Prime Minister Benjamin Netanyahu see the nature of the Iranian nuclear threat very differently. On Tuesday, Prime Minister Netanyahu is scheduled to deliver a speech before a Joint Session of the United States Congress. It is a good thing he is doing so. Yes, one would have wished that it was taking place under happier circumstances. It would have been far better if he were doing so at the invitation of or in coordination with the White House. Yet the negotiating policies of the Obama Administration regarding Iran have left him no other choice but to accept the invitation from Speaker of the House John Boehner to tell the Congress, the American people and a world audience why he objects to the apparent current outlines of a deal with Iran regarding its effort to attain nuclear weapons. President Obama has repeatedly pledged to prevent Iran from getting the bomb. President Obama has repeatedly said that his policy aims at preventing Iran from getting the bomb, not containing it after it has one. Yet in his arguments about why Iran should not become a nuclear power, he has refrained from discussing the fundamental nature of the regime in Tehran. Netanyahu has consistently done just that. He is able to discuss both the technical details of the Iran negotiations as well as the original reasons why Iran should not have the bomb. His speech can be a reminder of basic issues that have become lost in the focus on short-term political disputes and the details of negotiations. He can also remind his audience of the goals that he shares with the President's announced policy but which the proposed deal is not likely to achieve. Let's begin with a basic truth that you all understand: No Israeli government can tolerate a nuclear weapon in the hands of a regime that denies the Holocaust, threatens to wipe Israel off the map, and sponsors terrorist groups committed to Israel's destruction. (Applause.) And so I understand the profound historical obligation that weighs on the shoulders of Bibi Netanyahu and Ehud Barak, and all of Israel's leaders. Indeed, the entire world has an interest in preventing Iran from acquiring a nuclear weapon. A nuclear-armed Iran would thoroughly undermine the non-proliferation regime that we've done so much to build. There are risks that an Iranian nuclear weapon could fall into the hands of a terrorist organization. It is almost certain that others in the region would feel compelled to get their own nuclear weapon, triggering an arms race in one of the world's most volatile regions. It would embolden a regime that has brutalized its own people, and it would embolden Iran's proxies, who have carried out terrorist attacks from the Levant to southwest Asia. the bond between our two countries is unbreakable ... Our commitment to the security of Israel is rock solid ... The United States will "always have Israel's back when it comes to Israel's security. This is a bond that is based not only on our mutual security interests and economic interests, but is also based on common values and the incredible people-to-people contacts that we have between our two countries. even as we will continue on the diplomatic front, we will continue to tighten pressure when it comes to sanctions, I reserve all options, and my policy here is not going to be one of containment. My policy is prevention of Iran obtaining nuclear weapons. And as I indicated yesterday in my speech, when I say all options are at the table, I mean it. As the applause from the AIPAC audience and as Prime Minister Netanyahu's comments at the same White House meeting indicated, Israel and its supporters could take heart from what the President said three years ago. The subsequent policy of the Obama administration has strayed far from its early reassurances. The problem is that the subsequent policy of the Obama Administration has strayed far from those reassurances. As I have pointed out in previous columns, Obama's critics have argued that his actual negotiating strategy was not compatible with the policy goals of prevention that he stated so clearly on March 4, 2102. Senators, including Democrat Robert Menendez, contend that Obama has offered too many concessions to Iran. Michael Doran and others in Washington think tanks argue that his conduct of the negotiations is more compatible with a policy of allowing Iran to get the bomb and then containing it, rather than one of prevention. But perhaps this direction is not as surprising as it first appears. Let us look a bit more closely at what the President said—and didn't say–in March 2012. Although he spoke of the Iranian threat to Israel, he did not utter the words "anti-Semitism" or "Jew-hatred" to describe part of the core identity of the Islamic Republic of Iran. Nor did he address the issue of the irrationality that was likely to emerge if a regime controlled by religious fanatics were to get the bomb. He mentioned proliferation, terrorism and arms races, all of which were and remain important considerations. Indeed, President Obama knows very well that if Iran is able to get the bomb after these many years of efforts to prevent it from doing so, the Nuclear Nonproliferation Treaty (NPT) will be a dead letter and other states with governments of dubious stability and rationality will acquire nuclear weapons. A President who once talked of eliminating nuclear weapons in general would instead be known as one who ushered in an era of growing nuclear proliferation. Moreover, on that occasion, the President did not address the threat that a nuclear Iran poses to the United States, either through the use of terrorist proxies, through attacks on our forces in that region of the world or, over time, with intercontinental missiles able to reach the United States. A nuclear-armed Iran would ignite a nuclear arms race in the Middle East. It would give terrorists a nuclear umbrella. It would make the nightmare of nuclear terrorism a clear and present danger throughout the world. I want you to understand what this means. They could put the bomb anywhere. They could put it on a missile. It could be on a container ship in a port, or in a suitcase on a subway. 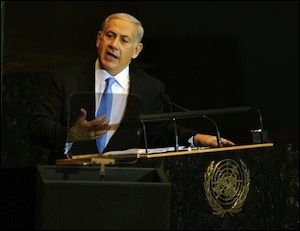 Israeli Prime Minister Benjamin Netanyahu addresses the UN General Assembly in September 2011. President Obama knows that what Prime Minister Netanyahu said at the UN four years ago is true. Yet though the President touched on critical issues in his remarks to AIPAC in 2012, he did not address the crucial issue that a regime rooted in the ideas of Ayatollah Khomeini and continued in those of Ayatollah Khamenei might very well not be deterred by the prospect of nuclear retaliation. He did not address the possibility that the leaders of the Islamic Republic of Iran were likely to place other religiously grounded goals ahead of that of their own survival or the survival of Iran. He did not address the prospect that for the first time since the nuclear era began, a state could come into possession of the bomb for which the past rules of nuclear deterrence among rational actors might no longer apply. He did not plumb the depths of irrationality that lurk in the heart of all radical anti-Semites. The United States has the economic and military resources to prevent Iran from getting the bomb. If it becomes necessary to use force to achieve that end, the Administration must present the full range of reasons for that decision. A regime animated by radical anti-Semitism not only poses a threat of a second Holocaust, but due to its dangerous irrationality, poses a threat to the whole world. President Obama and his leading officials insist that their policy remains one of prevention, yet they do not seem to understand the very people they are seeking to deter. Iran's ideological extremism has become lost in the fog of technical details. If we are to have an effective policy on Iran, we must first understand what makes the country tick, as well as its bombs. For six years, the negotiations with Iran and the understandable focus on technical details have pushed the deeper political truths about the character of the Iranian regime to the margins of public discussion. As David Horovitz has recently argued in this newspaper, Netanyahu's concerns about the course of the Iran negotiations appear to be "all too accurate." Yet it is the nature of that regime and its animating beliefs that are the decisive reasons why American policy must truly be one of prevention, not containment, and why all options must remain on the table. It is those unchanging beliefs that explain why the Iranian government has defied the P5+1 offer and has found various subterfuges to continue its nuclear ambitions. Well-grounded analysis of the Iranian government's character has given way to the technocratic imagination of arms control experts. Yet over the past six years, well-grounded analyses about the beliefs and character of the Iranian government have faded from public discussion. Instead, the technocratic imagination of arms control experts has held sway. In recent weeks, the papers and airwaves have been filled with arguments about protocol, partisanship and bipartisanship, diplomatic skill and diplomatic blundering, continue to distract attention from the main issue. They are a trifle and are of little importance compared to the joint American and Israeli goal of preventing Iran from getting the bomb, a goal that President Obama stated and states remains his own policy. It is the United States, not Israel, that initiated the trash talk diplomacy and personal attacks on the person of the leader of one of our closest allies. I have examined this sad history in several previous columns and won't belabor it now. It is crucial to place the common interests of the American-Israeli alliance ahead of these petty and stupid comments coming from anonymous staff members in Washington. It is noteworthy that in the United States those who are loudest in their denunciation of the forthcoming speech have invariably written and said next to nothing about Iran's march to the bomb in the past decade. Their past lack of knowledge about or interest in the subject does not keep them from proudly announcing their decision not to attend the speech. They have little credibility on the issue of Iran and the bomb. Any prime minister of Israel faced with the deal that is now being considered would likely act as Netanyahu has. Any prime minister of Israel faced with the deal that is now being considered would likely act as Netanyahu has. Indeed, they have a responsibility to do so. Benjamin Netanyahu has never lost sight of the nature of the Iranian regime and its animating ideology. He is now the only world leader who grasps the technical details about Iran's march to the bomb and has also publicly discussed the irrational and evil doctrines of hatred and paranoia that have produced decades of chants of "death to America," "death to Israel" and the effort to acquire nuclear weapons in that country. At the White House on March 5, 2012, Netanyahu graciously thanked the President for his solidarity and support and added that Israel had the right to defend itself. That, he stressed was "the very purpose of the Jewish state–to restore to the Jewish people control over our destiny. And that's why my supreme responsibility as Prime Minister of Israel is to ensure that Israel remains the master of its fate." When the survival of states is at stake in this world of nation states, there is no "international community" that will come to the rescue. Rather, each state is only as safe as its own means of armed self-defense combined with its alliances make it. The world is vastly more complicated than the international system analyzed by Thucydides but the realities of self-reliance and firm alliances are as true today as there were then. The P5 plus 1 negotiating states have their own interests that may and may not coincide with Israel's survival. But there is no doubt that it has been the policy of the United States defend our Israeli ally. Our shared values are well known. In the face of the Iranian threat—and by the way that of radical Islamic terrorism more generally–the saying that what starts with the Jews does not end with the Jews is one to keep in mind. Those who attack the Jews in modern history have also attacked the values and institutions of free societies that we Americans hold dear. The preservation of the American alliance with Israel has been and remains vital for defending American values and interests around the world. That is why the potential impact of Netanyahu's speech will not be restricted to the security of Israel. What he said about control over Israel's destiny is equally true about control over our American destiny for the reason mentioned above. Iran has given us no reason to trust any of its promises. After Putin's serial aggression in the Ukraine and now the shocking murder of Boris Nemstov, yet another member of the opposition to his rule that has been killed in recent years, there is no reason to trust Russia's involvement in a deal with Iran. The Congress of the United States has every right to listen to the voice of a leader who sees the Iranian threat more clearly than do our President and Secretary of State. President Obama has criticized the United States in the past for arrogance and a refusal to listen to the voices of others, even when they come from smaller and less powerful countries. This is not a time to compound those sins of hubris and arrogance. It is a time to listen to one who has the courage to dissent, who challenges the conventional wisdom of the best and the brightest in Europe and the United States, who looks straight into the heart of darkness and calls on us all to unite against a threat that should unite, not divide us. It is time to listen carefully to what Benjamin Netanyahu has to say to the Congress of the United States about how to prevent Iran from acquiring nuclear weapons. Jeffrey Herf is a professor of History at the University of Maryland-College Park and a fellow at the Middle East Forum. His recent works include: Nazi Propaganda for the Arab World (2009) and The Jewish Enemy: Nazi Propaganda during World War II and the Holocaust (2006).